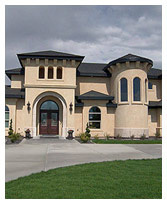 One World Builders is one of the most reputable and prestigious custom home builder in Idaho. From the initial consultation to completion, our professional team of experts will work with you to build your dream. Whatever type of design and location that you choose, our custom homes are built to your specifications and price range. We are committed in providing you a top quality home that will last for years to come. We serve the communities and surrounding areas of Twin Falls, Ketchum/Sun Valley Tamarack and Boise. We also have built homes for our clients in other areas of Idaho, please contact us for other locations. We also have built numerous custom homes as well as fishing lodges in the Latin America countries of Chile and Argentina. Our bilingual team members are available to not only build your home in Latin America but also in Europe and Asia. (Please visit our International Builder page for more information). It is important that our clients are getting the best value and quality for the homes that we are building. As a custom home builder, we realize that meeting the needs of our clients is paramount, and meeting those needs is where our reputation is based. One World Builders is a quality builder since 1997. It is our job to build you a dream house that you are not only proud of, but also will enjoy for many years to come. Contact us today for an initial consultation about building your dream home on Idaho. With our corporate office centrally located in Twin Falls, One World Builders is a builder of luxury custom homes. We build mostly in the Boise metropolitan area, Sun Valley, Tamarack Twin Falls and surrounding communities. For more information about building your home in Idaho as well as other locations please contact us at 208.280.3333 or you can email Corey Schoenauer at corey@idaho-home.com.